Having been treated to a whole new look in 2010, the Breitling Jet Team continues to distinguish itself by its breathtaking aerobatics shows performed at speeds of almost 700 km/h. In tribute to its stunning feats, Breitling has created a 1,000- piece limited edition of the Chronospace, the latest of its instruments for professionals. This model is distinguished by the silvery dial adorned with the new team logo and with a plane representing one of the seven L-39 Albatros jets composing it. 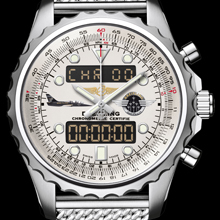 Based on cutting-edge electronics, the Chronospace offers a full range of functions that are useful to elite pilots such as those of the Breitling Jet Team – including 1/100th of a second chronograph with split times, alarm, countdown, dual timezone display with independent alarm, and Coordinated Universal Time (UTC). 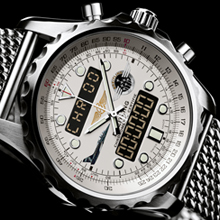 It is powered by a Breitling SuperQuartzTM movement that is ten times more accurate than an ordinary quartz caliber. The LCD screens are equipped with a backlighting system guaranteeing optimal read-off by day or night. The double caseback amplifies sound signals up to a level of 90 decibels. The circular slide rule serving to handle all calculations relating to airborne navigation is activated by rotating the star-shaped bezel – an original and extremely ergonomic design. The satin-brushed woven steel Aero Classic bracelet accentuates the original character of this sturdy, efficient and accurate wrist instrument. Movement: Breitling Caliber 78, officially chronometer-certified by the COSC, SuperQuartzTM (thermocompensated quartz), analog and LCD 12/24-hour backlit display (NVG compatible). 1/100th of a second chronograph with split times, alarm, countdown, dual timezone display with independent alarm, Coordinated Universal Time (UTC), perpetual calendar, battery end-of-life indicator. Case: steel. Resistance to 5 bars. Bidirectional rotating pinion bezel (slide rule). Cambered sapphire crystal, glareproofed on both sides. Screw-lock caseback with resonance chamber. Bracelet: Woven steel Aero Classic.